Based on the New York Times best-seller, The Reboot with Joe Juice Diet, by Joe Cross. Let us help you reach your weight loss goals and feel amazing. Features Available to All Users · Track all juices and food consumed · Log in exercise – walking, running, biking, swimming, stairs, etc. 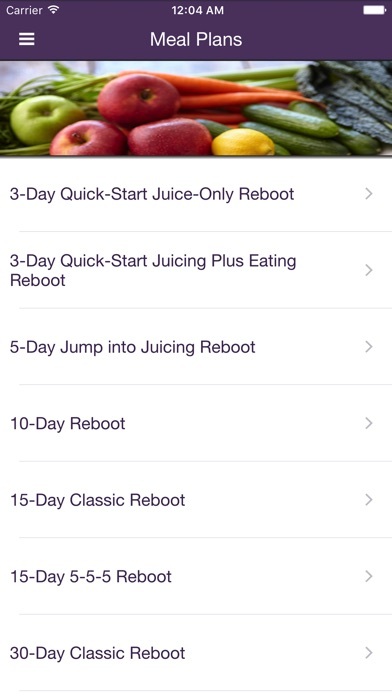 · Track mood + weight changes · Chart your progress · Instructional videos on juicing · Connect with friends and follow each other’s progress · Personalized tips and badges Features Available for Premium Users · Reboot Meal Plans (3 Day, 5 Day, 10 Day, 15 Day and 30 Day)* · Notifications at key moments of your plan (e.g. when to eat & drink) · Easier entry of juices and foods from plan · Shopping Lists · The app contains over 80 recipes: 36 juice recipes plus 46 reboot-friendly recipes (smoothies, salads, soups, and veggie dishes). 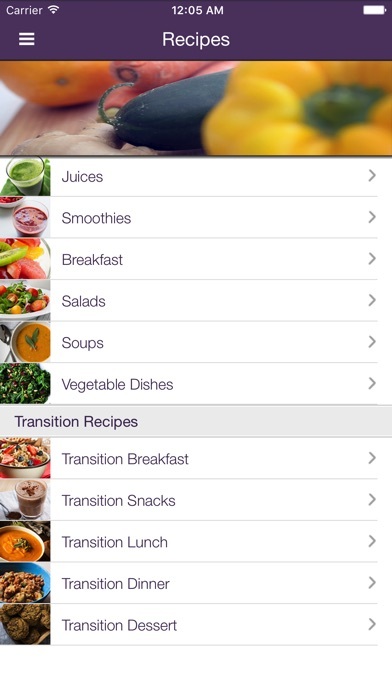 *Includes meal plans for those on a juice only diet as well as a juice + food diet. Use the app today for free or upgrade to our premium version and unlock more features. Note: an account is required to use the app (it’s free). I bought the premium version because I wanted recipes and shopping lists. I expected I’d be able to select my preferred recipes and creat shopping lists from them. Nope. 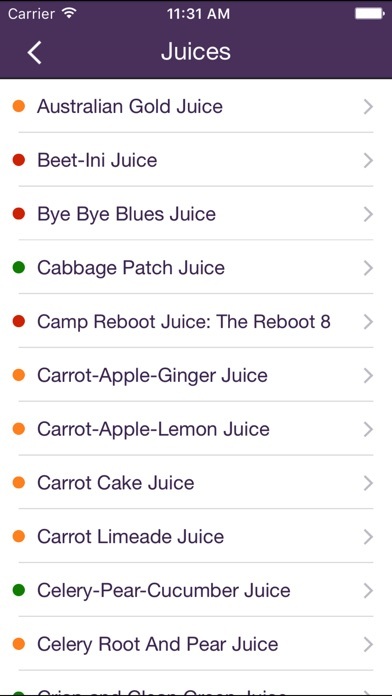 When you select your plan, it tells you what the juices are and you can’t swap out one for another. Pretty lame for an $8 app. Couldn’t even register or sign in with Facebook without an error msg. Sad. App should state this up front. Very disappointed that I couldn’t learn about the program before I purchased anything. This screams of someone who just wants to make money and not help people. I loved that I finally started this detox program. I lost 48lbs in 45 days. I am off most of my medicine and on my way to reaching my goal. 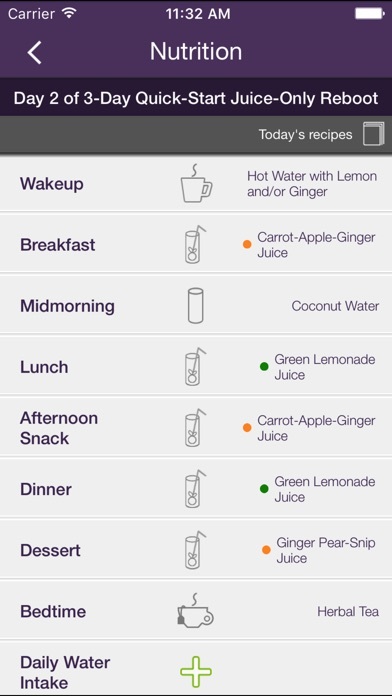 Thank you for this great app and program to get me to a healthier lifestyle. I downloaded the app and was going to purchase add on but now I can’t even get logged back in! I can’t even reset the password! I deleted and re-downloaded but still no use. Seems like it’s a great app if I could actually use it. Hopefully someone sees this review and looks into it. I went ahead and purchased the app. Only way to get the necessary features but there are some hiccups I wish the developers would fix. Like extend the reboot feature is very temperamental. Sometimes it works sometimes it doesn’t. Right now it doesn’t so I can’t extend for any length of time! Sure wish the developers would listen to all of the comment here! Update well I originally gave this app 3 stars but now I’m only giving it one! I spent money only to not be able too I use the app AT ALL! Really frustrating! After 3 days of not being able to extend my reboot I tried to end it. Nope it won’t even let me end it! So I thought I’ll delete the app then reinstall, well now I can’t get logged it! Total waste of money! And not even a peep from the developers! If you are thinking of buying this app, my advice is DON’T!!!!! Won’t let me log in. I logged out and can’t log back in. Just Keeps says, “sorry something went wrong”. Bummer, I liked what I saw in there. I’ve been with Joe since the beginning. Back in the day Joe was all about helping people. He provided his videos for free on multiple streaming sites and his reboot plan for free as a PDF on his website. Now it’s all about the money. 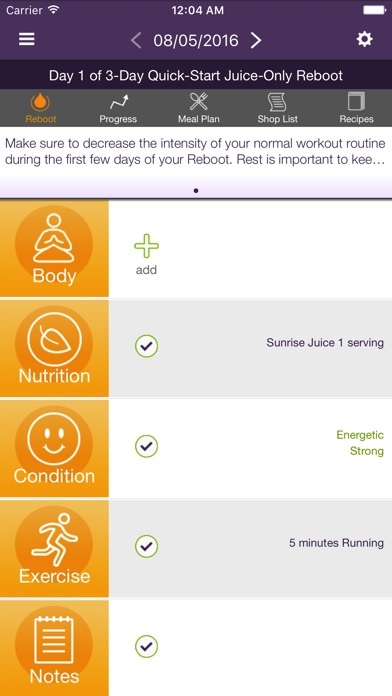 His reboot plan is only available as a 150 usd “guided reboot”, through his book, or here via an 8 usd in app purchase Yes the app entitled “reboot” does nothing for rebooting without an 8 usd iap. The app does offer some recipes/tips for free. Bravo! Of course the same info is published on the web site but here the “free” app content is walled off to only folks that are willing to create an account with Joe (or give their FB or google information) But are the app recipes/tips free? Given that Joe is all about the money these days I’m sure that giving him such information (email, fb or gooogle account info) will be monetized in some way too. For myself Joe lost me at the required account/login for accessing any content on the app. I’m deleting it. If I do a reboot, I’ll dig up the old pdf and if i can’t find that I’ll buy a used copy of his book. This all saddens me. While juicing is wasteful, I believe it does have some benefits.